Kids have spying and discovering minds. They always want to explore the world around them and give details of their findings. They act relatively like young spies, discovering new things and reporting back to their parents with the aim of finding an explanation to their findings. Spy kits for kids are fun-filled and educational toys for kids. With spy kits, you introduce your kids to more complicated games and toys to keep up with their ever developing exploratory and discovery skills. Spy games for kids is part of growing up, we loved going on undisclosed missions around the garden, home or in the locality. There are a lot of proofs that show that this type of game benefits a child’s development enormously. Spy detective games for kids are great fun, apart from the physical benefit of helping the child live an active lifestyle, the act of playing hide and seek, little spies or secret agent, help your child’s imagination and is arguably one of the best ways to hold his interest. Role-playing toys and games are great for healthy growth and development of children. It helps them to grow into more responsible adults. The preference of kids may vary but all children enjoy role-playing. Some of them may love role-playing games like playing chefs, police detectives, babysitters and so on. 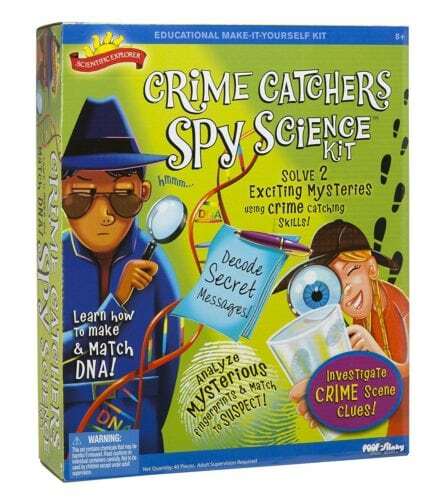 Some kids love role-playing games and toys that relate to forensic science. Luckily, with the development of modern technologies, various types of toys that encourage role-playing in kids and help them act as secret agents are available in the market. Spy kits for kids and the toy industry are both keeping up with the spying tendency of kids and providing little spies with fun and exhilarating options to undertake their secret missions. Are you looking for the best detective kit for kids? We have carefully selected, in this article, top 12 spy gadgets that would interest kids especially, those of them inclined to forensic science. 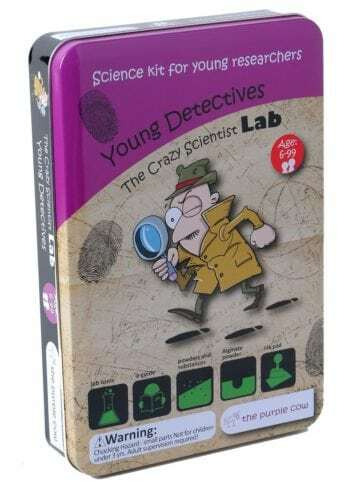 The Scientific Explorer Crime Catchers Spy Science kit comes with two intriguing mysteries and eight different activities that give your little detectives the opportunity to learn how the detective science works. It is a safe, educational and fun way to let your little investigative mind explore clues and collect evidence by fingerprint matching, powder, and liquid tests and learn how to decode secret messages like a pro. It comes with an easy to following instruction guide that takes the little investigative minds through the entire activities. You must be around to monitor your kids through the activities. The spy kit is filled with an actual fun activity for kids that let them explore mysteries with the use of forensic science. Some of the scientific investigative activities are chromatography, DNA extraction, a few basic chemistries of citric acid, fingerprinting, and so on. The kit is suitable for 4th graders and maybe kids up to the 8th grade. It would serve as fun for the older kids too but maybe not all the activities would interest them, or present a challenge to them. This would make a nice gift and a great exploratory tool especially if try some of the additional activities. 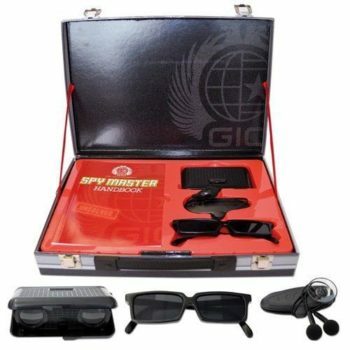 The Ultimate Spy Bag kit helps your little investigative mind to learn to act like a secret agent more than twenty spy tools included in the pack. The fingerprinting kit helps your small detective to dust powder over fingerprints, and subsequently, use it as shimmery makeup powder. This is one of the best secret agents spy tools from NOV8. This camouflaged spy gadget helps amateur crime detectors to learn how to investigate crimes stylishly even as grow their knowledge of forensic science. The NOV8 spy bag lets your young minds use various scientific studies like chemistry, biology, and physics to decipher codes while exploring cases. Fingerprinting is one of the oldest methods they use. The oil residue created by the individual’s fingerprint creates a fingerprint that is used in crime detection. The ridges in the fingers of every individual are unique to him or her, which lets criminal investigators use the study of fingerprint patterns in crime detection. This toy kit provides your little mind with all the essential tools to start deciphering cases and cracking codes like a professional forensic scientist. The kit also comes with cards that let you little spy collect fingerprints which is great. Overall, the kit is cool, lots of fun the experiments are easy to follow. Although the kit is a bit costly, the value is well worth the price. You and your little mind will always remain happy for buying this spy bag. 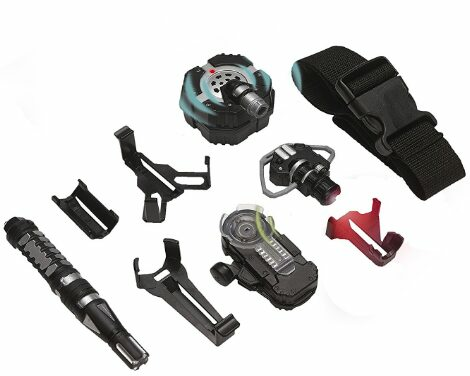 The SpyX MukikiM Micro Gear Set comes with four great Spy gadgets fixed to an adjustable Belt with clips for easy portability and to make the spy gadget handy when you are on the move. It comes with Micro Ear Light feature that let your junior detective see in the dark. The spy gadget also let the little secret agent write and crack secret messages with the Invisible Ink Pen, while the Micro Listener lets your little investigator secretly hear conversions from remote positions. The adjustable belt makes flexibility possible and gives your child the capacity to spy at his or her target hands-free. The SpyX gear set can be worn both or the waist or around the shoulder. The Micro Motion Alarm helps to detect movement or shuddering. With this spy toy kit, you’re offering your little investigative mind with the essential tools he requires to unlock unlimited possibilities as a professional secret agent. The spymaster briefcase comes with a handbook to make the spy mission of your little secret agent a success. The fun-filled back view spy glasses lets you view what is happening at your back. It comes with the mirrored outer edges which case the reflection of the back view. It is a one size gadget that fits both children and adult alike. Turning on the spy listening feature tunes the receiver. With the receiver pointing towards your target and the earphones in your ears, you’ll activate sound spying. The black toy briefcase comes with all the tools that let your little detective mind move secretly without being identified by the crime suspect. The included binocular offers your little secret agent with a sharp sight. The rear glasses disguise you while at the same time allowing you to see all that is happening at your back. The cleverly innovated Spy Ear device lets your little spy pretend to be listening to the headset when he or she is, in reality, snooping on suspects quite a few meters away. 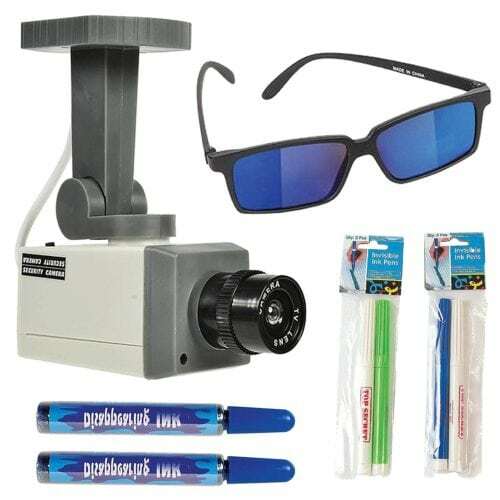 The kit offers little detectives a clever way of watching their suspect without their notice by just putting on the glasses and walking a short distance in front of them. 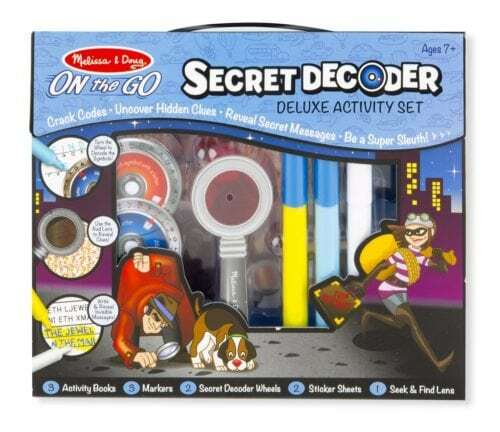 Melissa and Doug On the Go super sleuth toy give your children all the tools they need to decipher codes, scribble, and uncover invisible messages. It comes with over fifty fun-filled activities that would captivate your child’s intriguing mind. The secret decoder set features a whole lot of puzzles that help little spying minds find the answer to and uncover lots of mini-mysteries. This plush kit comes with three activity books with each of them covering a different spy technology. While the decoder ring helps your little spying mind to uncover secret messages, the spyglass help him to expose hidden clues. The trusty secret-message pen is a great fun way to solve varieties types of mysteries. The toy decoder will make your little one write a lot of stuff. With the invisible marker, your young investigator and a secret agent will enjoy writing a secret message for you all day long. Overall, the spy kit is a lot of fun and gives your kids a toy kit to both satisfying them and educate them. The revelation of hidden messages with red lenses or special markers would be particularly satisfying and exhilarating for kids. It makes an excellent go-to gift for little kids. The ArtCreativity spy gear set is a child’s surveillance tool that helps to foster his imaginative ability and creativity. With this spy-kit, your little minds can play make-believe throughout the day while at the same time developing their social skills by interacting with fellow kids. It is suitable for little detective minds aged above 6 years. The kit’s camera helps to keep your kids engaged. Despite the fact that it is a toy, it looks real and its built-in motion sensor lets the camera to realistically spin around in a persuasive manner. With the spy glasses, your children can easily view a person coming at their back while the spy pens serve as an exciting method of passing secret information across. The spy kit is a fun toy that would keep your kids engaged for hours. Setting up the surveillance camera will be a lot of fun for them although they would require a bit of help from the parent to experiment and set up kit tools both inside and outside the house. It contains all the equipment your kids need to satisfy his or her spying curiosity. It serves as both a great educational tool, science investigative tool and fun tool for your child going through spying life phase. The invisible markers and pen tube help to children to pass messages than vanishes within minutes to their peers. The Purple Cow detectives Science kit comes with CSI games and fingerprint kit suitable for young detective minds and makes full of fun. The kit includes seven experiments that make fingerprint science experiments fun and simple for your little minds. With this detective science kit, your little secret agents will learn in a fun-filled manner how to use different experiments to extract invisible fingerprints. The spy kit makes your kids’ real world researchers in their own private lab and gives the opportunity to carry out great scientific experiments while enjoying the fun of it all. Give your little one a treat with this fun and educational game kit that turns him into a forensic scientist and improves his or her developmental learning. To make the educational kit child-friendly, it comes with an easy to follow step by step instruction. The toy can serve as a great tool for a child doing homeschooling. The science kit will also make a great training kit for teaching groups of children in a home school or in a classroom environment. The Alex toys super sleuth kit is a spy kit for a child with a detective mind. It assists your child to develop his or her educational and learning skills by observation, imaginative analysis, and creative fun-filled activities. Some of the activities that your child can practice with this kit include how to figure out complex IDs, take fingerprints and crack codes. The kit comes with easy to follow instruction manual to help your little mind’s exploratory activities. 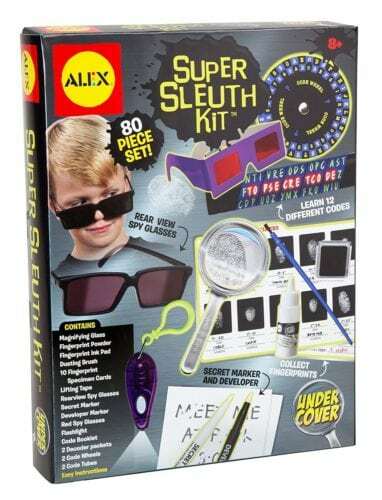 ALEX Toys Super Sleuth Kit fulfills the need of detective mind of every child. It also makes a great gift for teenagers with curious minds. You’ll be amazed at your little kid observation and creating reasoning improvement with the use of this spy toy. The game itself is beneficial to amateur sleuths. Features like rearview glasses, code wheels, and composite drawing tools would be handy for them to use in a lot of different imaginative detective situations. With the easy to read user’s guide, your child can learn to take fingerprints, document the movement “suspects'”, and decode coded communications. The spy game is perfect for both boys and girls and comes with a collection of activities including the search for clues which makes full of fun. 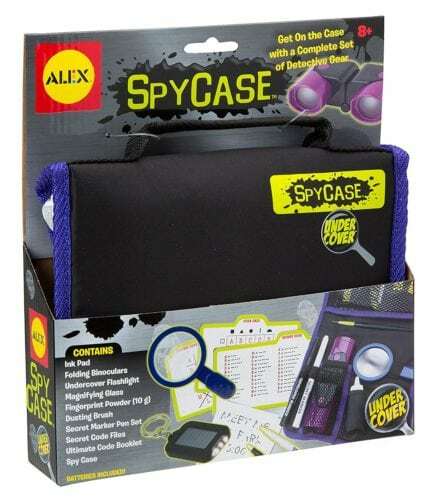 Alex toys undercover spy case detective gear set is a handy and portable set that your child can easily take with him on the go to full detective activities a success. The toy kit comes in a sleek nylon case that helps your little spy to get all his spy tools organized in a compact manner. The spy case contains a convenient handle for easy mobility. Your child can easily loop the handle through the belt for easy haulage at will. The kit is designed to encourage your child’s imaginative ability and developmental learning ability. The undercover spy case set is structured to help kids engage in pretend play. It will amaze you to see how your kids would utilize the kit to act as secret agents by cracking the codes. The pretend play that comes with the kit helps to boost your child’s creative ability and enhance his or her social skills. Your child will find the kit a lot of fun especially if he or she loves to play the detective. The Ravensburger Science X CSI Crime Scene Investigation Activity Kit features twelve great Science Activities that encourage your kid’s investigative mind to learn in a fun way. The activities are hands-on and easy projects that can be done with easy to use materials. The explanatory manual makes it easy for the kids to become vigorous and energetic scientific investigators. The activities are designed by experts and forensic biologist to give your child early insight into professional crime analysis and investigations. The amazing and exciting exercises teach your child how to scientifically investigate clues like a skilled detective. The quality of this kit is good enough for trainee investigators to practice. It comes with exciting and fun investigative activities that are practical in everyday professional crime detection activities. Some of the activities included can help your kids to learn how to split hair and make an analysis of tire tracks. The kit also teaches children how to do fingerprinting, shape dropping, obtain footprint impressions and save for subsequent evaluation. The science kit makes your little mind an investigative scientist with the capacity to isolate DNA and make a copy of keys for investigative purposes using the dough. Science X CSI spy kit allows your kids to examine, manage, gather evidence and evaluate them, little criminal investigators and forensic experts. 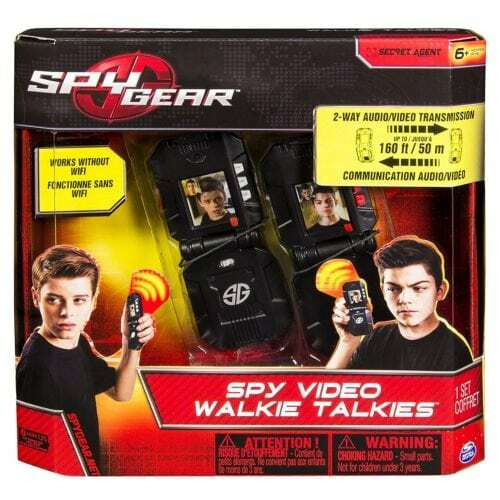 The Spy Gear Video Walkie-Talkie is amazing spy kit that’ll definitely interest your kids’ spying mind. Its picture quality is astonishing for a toy. It can transmit up to 160 feet or a couple of hundred yards. It is a bit costly given the fact that it is a toy. However, for the amazing features of excellent image display and the sound quality, it is a good value for the prize. It comes with a feature that lets one holder speak to the other party while the other side is in a mute mode. The game is not complicated and kids can easily use them. It is great kids’ walkie-talkie and displays the person that the kid is speaking to at the other end in a large image while the speaker displays as a smaller image at the top left-hand corner of the spy kit. When you put the walkie-talkie in a remote Spy Mode, it serves as a hidden camera for your child’s live-feed surveillance activities. The automatic turn-off mode is great and lets your child conserve power when the walkie-talkie is not in use for more than fifteen minutes. The automatic fold features preserve the screen and make compact storage possible. Also, you don’t need any internet data or Wi-Fi to get two-way communication. The wireless transmission activates as soon as you turn on the button. Although it is not comparable to a computer image, it definitely makes great spy tool for kids and is pretty fun to use. The Spy gear camera is a handy surveillance camera that allows your little mind to spy and record anytime and anywhere. It comes with the clip mount which lets your kid clip it anywhere to get shots of the most difficult angle. It is a great toy idea to help your kids learn how to take pictures and record videos although the image quality is not as great as that of a standard adult camera. The battery required to operate the camera is also included in the pack which makes it really a cost-effective option. The Spy Go Action Camera boost your child’s spying and surveillance ability and give him a fun-filled experience while assuring that he captures every action from any angle of choice. The camera can let your child take roughly 1500 motionless pictures or record 15 minutes VGA video footage. It comes with a USB cable that ensures the child’s surveillance activities history is not lost. With the cable, you can transfer the pictures to tablets or PCs for the child to view and free up more space for your child’s investigating and exploring mind. With thousands of spy gadgets out there, it is easy to get overwhelmed and not know which option suits your child imaginative ability. All the spy toolkits we have selected in this article are great for your child’s learning and also make a fun-filled activity that helps their social skills development capacity. 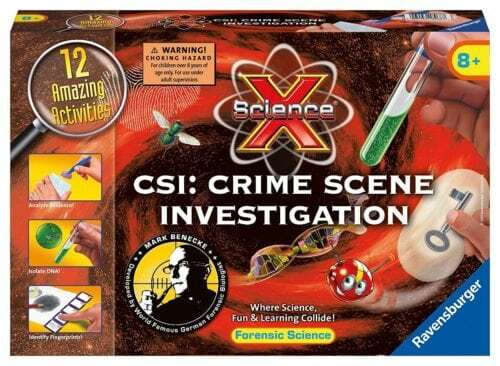 However, we have chosen the Ravensburger Science X CSI Crime Scene Investigation Activity Kit as the best overall pick in the list because it comes with exclusive features that are not only fun for your children play activities, but it comes with a good quality build that it can also be used by amateur investigators. The safety of the kit is also great as it doesn’t come with harmful chemicals that could have adverse effects on the kids. Above all, if you want a spy kit that let your children get the most out of the price, this bit of kit properly fits the bill. 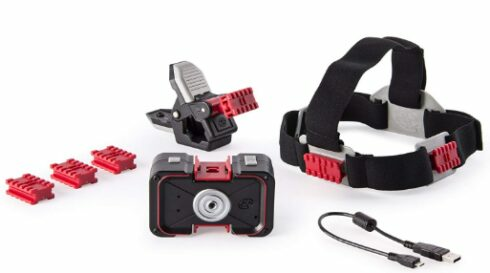 The Best Budget buy for kids on our lists is the Spy Gear Spy Go Action Camera. The reason is obvious; it comes with a lot of fun-filled and amazing features that fascinate your child’s intriguing mind at an affordable price. Letting your child take up to 1500 still images and 15 minutes continuous video footage is a lot of offer at its relatively low price of roughly 10 dollars. In addition, the clip feature makes it possible for your child to clip it anywhere to capture any image angle of choice. Overall, it is a fun spy kit for your kids to play with a lot of images and videos and learn how video recording and taking pictures work!